Walking one mile a day is an excellent way to start a fitness program. Walking raises your heart rate and burns calories. However, a slow walk for a short distance does not burn a significant enough number of calories on its own to promote weight loss. If you are gaining weight on your current food and exercise plan, you need to tweak your routines to burn more calories than you consume. The American Heart Association recommends a minimum of 30 minutes of moderate physical activity per day. This minimum time guideline helps you achieve cardiovascular health. However, to lose weight you need to increase the distance and speed of your walk to burn more calories. If you weigh 185 pounds, a walk at 3.5 mph burns 356 calories per hour. Increase your speed to a power walk at 4.5 mph and you'll burn 444 calories per hour. By burning 356 to 444 calories daily, walking five days per week, you can lose between 2 and 3 pounds per month. If you want to keep your aerobic workout short, make the minutes count by doing more challenging activity. While the calories burned vary according to your weight, height, age and pace, you can intensify your exercise routine. Walking uphill, for example, burns between 438 to 654 calories per hour. 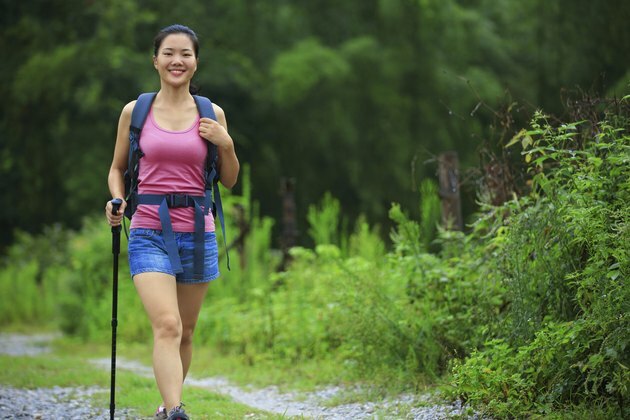 Add a weighted backpack to that walk and you burn between 511 to 763 calories per hour. Walk up stairs or on a step treadmill and you burn 657 to 981 calories per hour. Aerobic exercise burns more calories than weightlifting, but doing muscle-building exercises helps you trim away fat and replace it with lean muscle mass. As you increase your muscle, you raise your basal metabolic rate, meaning that you burn more calories around the clock. After you do your walk or other aerobic workout, spend some time on resistance training. Do sun salutations while breathing deeply and you strengthen your core, upper body and lower body muscle groups. Hit the ground for pushups for a total body workout. Work your upper body with pullups and triceps dips. Increase lower body strength with deep squats, jumping and lunges. Doing aerobic exercise and strength training burns calories, but you may be underestimating your caloric intake. Maintain a daily diet plan of 1,600 to 1,800 calories by switching to more healthful food choices to keep your diet nutritious yet low-calorie. Begin by filling half your plate at every meal with lightly dressed salad, fresh fruit, chopped vegetables or roasted vegetables with a drizzle of olive oil. Save the other half of your plate for filling, nutritious foods such as legumes, nuts, grilled or steamed fish, and whole grains.